The starting pitcher is the individual who delivers the first pitch of a baseball game and in certain cases is the individual to deliver the last. Starters are relied upon to lead the defense and set the tempo for the game ahead, serving as the “field general” that leads the charge towards victory. As the 2013 College World Series commences on Saturday, teams will send out their staff aces to lead the charge in Omaha, setting the tone and establishing whether their respective team is capable of moving forward with the determination and talent to capture the NCAA title. Below we have ranked the top 5 starting pitchers that will appear in the College World Series. In ranking each starter, we considered all encompassing factors that have and would contribute to the success of that pitcher in Omaha, such as season-long success, recent performances, and overall pitching ability/talent. Simply put, Carlos Rodon has been the class of the field this season along with Stanford’s Mark Appel and Oklahoma’s Jonathan Gray (Stanford failed to make the postseason while OU was swept by LSU in the super regionals). In two starts this postseason, Rodon has dazzled for the Wolfpack. In game two of the Raleigh Regional against William & Mary, Rodon pitched a compete-game shutout and struck out 10 batters in a 1-0 victory for NC State. Rodon brought a no-hitter into the sixth inning and struck out the side in the ninth to end the game. Rodon was once again effective in game one of the Raleigh Super Regionals against Rice, going 8 1/3 innings and surrendering three runs, while striking out nine. In leading the Wolfpack to a 4-3 victory, Rodon has now struck out eight or more batters in all but one of his 17 starts this season. Everything has been in-sync for Rodon this postseason, as his fastball, cutter, and slider have been overwhelming pitches with plus movement and velocity. Expect Rodon to continue his dominance in Omaha. Aaron Nola has been lights out this season for the Tigers, dominating college hitters with his superb command and control of his pitch arsenal, comprised of a low-mid 90s fastball and solid breaking ball combo that he can paint across the lower part of the plate. His dominance continued into the postseason, as he helped lead the Tigers through a sweep of both regional and super regional play. Despite surrendering five runs (all unearned) in the first inning of game two of the Baton Rouge Regional against Sam Houston State, Nola buckled down and held the Bearkats scoreless for the next six innings en route to an 8-5 victory for the Tigers. Nola pitched masterfully in the Baton Rouge Super Regional opener against Oklahoma, pitching a complete-game shutout and allowing just two base runners in a 2-0 victory for LSU. Nola will get the nod against UCLA in the College World Series opener on Sunday, June 16 in Omaha and will look to shut down the Bruins’ offense. 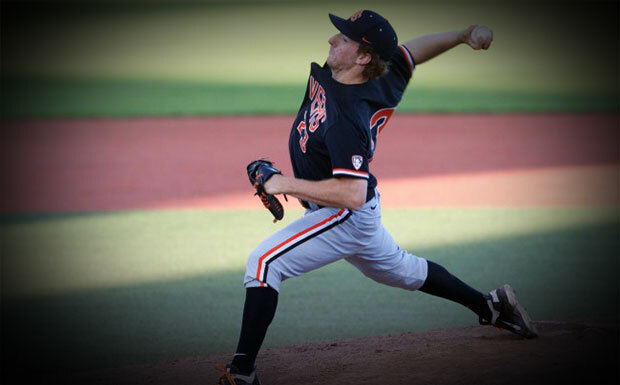 Pac-12 Freshman of the Year and recently named First-Team All-American by Baseball America, Andrew Moore has been a great addition to the Oregon State starting rotation this season alongside fellow southpaw Matt Boyd and Ben Wetzler. In game two of the Corvallis Regional against UC Santa Barbara, Moore pitched eight innings and surrendered two runs (one earned), holding the Gauchos scoreless for five straight innings following the third en route to a 3-2 victory for the Beavers. Moore would provide the Beavers with another deep-inning effort, working eight innings of three-run ball and striking out nine batters. The Beavers would win game two of the super regionals 12-4 against the Wildcats, following up with a 4-3 victory to oust Kansas State and advance to the College World Series. Look for Moore to be an innings eater in Omaha whose poise on the mound will be key for crucial games. 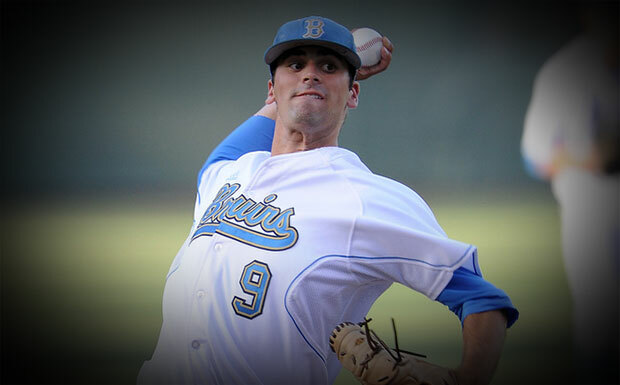 Adam Plutko has been the face of consistency and reliability for the UCLA Bruins over the past three seasons, taking on the role of staff ace with the departures of Gerrit Cole and Trevor Bauer after the 2011 season. In game one of regional play against San Diego State, Plutko pitched seven innings of two-run ball, fanning four and walking just one in a 5-3 victory for the Bruins. Plutko would follow up with a dominating performance against Cal State Fullerton in the Fullerton Super Regional opener, going seven strong innings and surrendering one unearned run in a 5-3 UCLA victory. The game would go to extra innings following a Titans comeback in the eighth, costing Plutko what would have been his sixth straight postseason victory in six career starts. Plutko appeared poised and at ease in his two starts this postseason, mixing his pitches effectively and locating the ball with precision. He is a workhorse with sound mechanics and smooth demeanor. The Bruins will lean on Plutko to set the tempo for a championship run in Omaha. 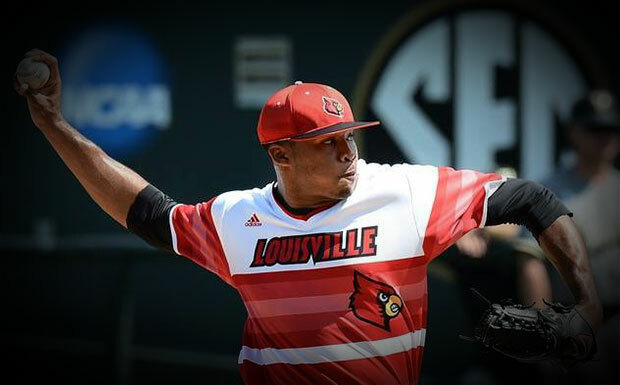 Jeff Thompson has been a warrior and a workhorse for the Louisville Cardinals this season, anchoring a starting rotation that has become one of the best in college baseball this spring. Thompson held the Miami Hurricanes to just one run on three hits over six strong innings in game two of the Louisville Regional, cementing a 6-4 victory for the Cardinals. Thompson would follow up with another dominating performance, this time against the number two ranked team in the nation, the Vanderbilt Commodores. In seven innings of work, Thompson surrendered just one run and struck out nine batters en route to a 2-1 victory and the Nashville Super Regional, leading the Cardinals to their second College World Series in school history. Although Louisville has typically used Thompson in their number two slot, they may wish to start him in the CWS opener against a hot-hitting Indiana on Saturday, June 15.